Results of a 1 year study on over 4,500 consumers provided data on attitudes and action taken by people regarding hair loss and validated the efforts to disseminate vital information for the HairMax LaserComb. PR Log (Press Release) – Dec 16, 2009 – Boca Raton, FL. Lexington Intl, manufacturer of the HairMax LaserComb, the only laser phototherapy device cleared for marketing by the FDA, announces the findings of a major 12 month study on hair loss. Over 4,500 male and female consumers responded to the survey which generated a wealth of data on peoples’ perception of hair loss and the actions they took to treat their condition. Respondents were asked to complete a 16 question multiple choice survey and were also asked to provide open ended comments at the end. Data generated from the study by age of respondents mirrored the incidence of hair loss found in the general population. One of the main goals of the survey was to discover which factors influenced their decision to treat their hair loss and what action they took. While the result showed, as expected that over two thirds of respondents were ‘dissatisfied with their appearance’, almost 40% of respondents indicated that lack of confidence or a ‘negative impact on social or job situations’ was a key factor in seeking treatment. The findings also highlighted how important it is for physicians to become fully knowledgeable about the device as over 45% of respondents visited a doctor and of these 41% sought advice from a dermatologist. Finally, the study confirmed the cost involved in treating hair loss in that while almost two third of respondents indicated that they spend up to $25 a month in treatment for their hair, almost 20% spend up to $50 per month. Of those who purchased products to treat their hair loss, almost 50% purchased minoxidil, while almost 40% had purchased vitamins and herbal supplements in an effort to try to ameliorate their condition. Lexington also sought to understand what factors motivated individuals to purchase the HairMax LaserComb. In this age of electronic media, it was no surprise that over 50% of respondents found information on the HairMax either from a search engine or other web sites. While many people now question the value of newspapers or magazine as a source of information, the survey showed that one quarter of respondents heard about the device from newspapers and magazines. Lexington has devoted tremendous resources to assure that the HairMax website, www.hairmax.com has high value and motivation. The survey validated these efforts as the site was found to be highly informative, provided useful information, and motivational to purchase by two thirds of respondents. Since the HairMax is a one time purchase that has an expected lifetime of over 10 years and does not require the purchase of other ancillary products, a key question in the questionnaire related to the perceived value of the HairMax relative to price. Overall, respondents indicated that the information people found about the HairMax made them “recognize the HairMax LaserComb as a tremendous value long-term”. The money back guarantee for the device also was found to be a major determinant in the decision to purchase the HairMax by over 40% of respondents. Since the HairMax is the only laser phototherapy device for hair growth cleared for marketing by the FDA, over 30% indicated this imprimatur was a major factor that influenced them to purchase the device. Leonard Stillman, Director of Professional Services said: “This study provided meaningful data on patients’ perception and actions taken to treat their hair loss. Most importantly, the survey clearly pointed out the need people have for information on hair loss, and the fact that the web site for the HairMax answered this need”. Lexington will continue to be diligent in its marketing efforts for the HairMax to asure that information about the device is informative and valuable to the many million of people who suffer from hair loss around the world. Based in Boca Raton, Lexington International is a manufacturer and developer of advanced medical laser devices to treat hair loss and scalp disorders. Lexington International markets the only laser phototherapy device cleared for marketing by the FDA to promote hair growth in men suffering from certain classes of Androgenetic Alopecia. The company, was one of just 14 leading manufacturing exporting companies nationwide to receive the 2009 U.S. President’s “E” Award, which recognizes successes in world markets and subsequent contributions to the U.S. economy. Over the past 8 years and in over 125 countries worldwide, Lexington Int., LLC has helped hundreds of thousands of individuals improve their appearances with innovative products to treat their hair. 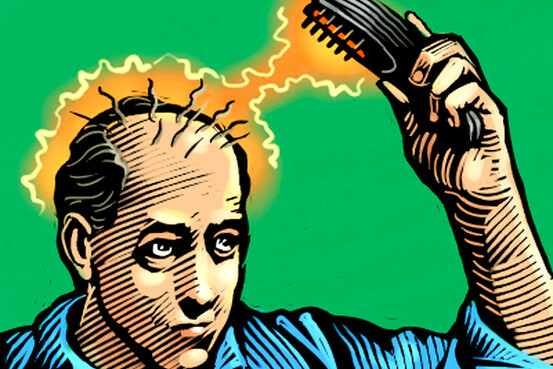 Can Lasers Stimulate a Hair-Growth Spurt? Losing your hair? Just glide a handheld laser over your scalp three times a week and you’ll see a benefit, say the companies selling the products. Many doctors are skeptical of claims made for the lasers, but a study found that one product did spur hair growth. Hereditary hair loss is a medical condition that affects some 50 million American men, according to the American Academy of Dermatology. Medications, including the oral drug Propecia and the topical Rogaine, are often used to treat it. But the drugs don’t work for everyone and can have side effects, according to dermatologists. A number of companies sell handheld, low-intensity lasers for home use that are intended to stimulate hair follicles, typically three times a week for 10 to 15 minutes. The lasers, which aren’t covered by insurance, are available online, at some doctors offices and at some retailers. The HairMax LaserComb by Lexington International LLC, Boca Raton, Fla.—which looks like a hairbrush with a cord—costs $495, with a $25 discount available online. The X-5 is a $299 rechargeable hockey-puck-shaped device sold by Spencer Forrest Inc., Westport, Conn.
Scientists say that low-level lasers are safe and likely do act on cellular compounds that can spur hair growth. One major published study showed an average 7% increase in hair density with the HairMax after 26 weeks. But many doctors are skeptical of the claims made by the companies, particularly those that promise fast results and show clients with full heads of hair. “I think it is an expensive tool for very little difference,” says Amy McMichael, an associate professor of dermatology at Wake Forest University School of Medicine in Winston-Salem, N.C.
Eric S. Schweiger, a clinical instructor of dermatology at Mount Sinai Medical Center in New York, says the LaserComb helps grow hair, but adds that effects are often modest, typically take at least six months and aren’t seen in all patients. It’s best to try the laser before your hair follicles are too damaged, doctors say. “If you’ve got a shiny bald head it won’t do anything,” says Michael Hamblin, associate professor of dermatology at Harvard Medical School. The only home laser device cleared for hair growth by the Food and Drug Administration is the LaserComb, which claims to increase hair growth in men. While used by Dr. Schweiger and others for women, the device isn’t FDA cleared for them; a clinical trial is continuing, the company says. Other companies that don’t have FDA clearance for their devices avoid making medical claims. Spencer Forrest claims the X-5 makes hair “visibly thicker,” but doesn’t promise to actually grow it. The company says it is performing trials and plans to apply for FDA clearance. So far, Lexington International is the only company with a major published clinical study. In a 110-patient company-funded study published in the April issue of “Clinical Drug Investigation,” researchers found subjects using the LaserComb for 26 weeks saw an average increase of 17 hairs per square centimeter, or 7%, compared with a decrease of nine hairs in a control group using a sham device. Independent trials are needed to replicate the results, says Marc R. Avram, an associate professor of dermatology at Weill Cornell Medical Center in New York. A small pilot study at Weill failed to replicate the findings but larger, controlled studies are needed, he adds. In May 2008, Lexington received an FDA warning letter alleging it was selling a different device than the one cleared for sale in 2007. Company owner David Michaels says the company did substitute a similar laser with an equivalent output and thought the change was permissible based on “legal advice,” but switched back to the original when it got the warning letter. The FDA says the issues from the warning letter, which included marketing to women on the company’s Web site, have been resolved. So far the only side effects reported with the lasers have been itching and tingling of the scalp. Popular hand-held laser device LaserComb might revive follicles for some men. Maybe. Americans spend billions on hair-care products each year, a remarkable investment for a part of the body with no real function. We clean it, nourish it and style it — and we definitely mourn its loss. Lots of products and procedures promise to restore thinning or disappearing hair. One especially intriguing option is the HairMax LaserComb, a hand-held laser device that supposedly revives hair follicles. Hailed on TV news programs as a potential “cure for baldness,” the device received FDA clearance for men in 2007. Unlike drugs, most medical devices can be approved without rigorous testing. A company must merely persuade the Food and Drug Administration that the new device is “substantially equivalent” to other products already on the market. In this case, the makers of the LaserComb told the agency that their product was roughly as safe and effective as a wide range of other laser devices, including a gadget intended to kill lice. They also claimed to be in the same league as the Evans Vacuum Cap, an early 20th century hair-growth contraption that’s pretty much what it sounds like. The LaserComb is sold online and through the SkyMall catalog for about $500. Users are instructed to slowly move the comb back and forth through their remaining hair for 10 to 15 minutes at a time, three days a week. Lasers can undoubtedly encourage hair growth, says Dr. Marc Avram, a clinical associate professor of dermatology at Weill Cornell Medical College in New York City. In fact, a small percentage of people who undergo laser hair removal end up with more hair than they had to start with. As Avram and colleagues noted in a 2007 issue of the Journal of Cosmetic and Laser Therapy, many hair-loss centers offer treatment with low-level laser devices, and some patients really do seem to benefit. Nobody knows why hair responds to lasers, he explains, although it’s possible that the beams somehow encourage blood flow to the follicles. “In 20% of the subjects, it seemed to maybe have an effect” on the appearance of hair, Avram says. The study hasn’t been published yet, and it didn’t include a control group for the sake of comparison. Avram readily admits his study “isn’t definitive,” but he hopes it might encourage more research in the future. By contrast, Rogaine and Propecia have already been tested in multiple high-quality studies and have been shown to stop hair loss in 80% to 90% of patients, Avram says. Michaels says the company has asked the FDA for approval to market the device to women and expects a decision soon. 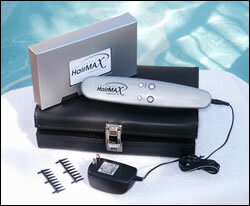 The HairMax LaserComb has recently been awarded FDA approval as a treatment for male hair loss. This is grounbreaking news – we have been saying for over 2 years that this excellent device deserved FDA approval and they have finally got it! After years of extensive research and clinical studies in hair growth this convenient, hand-held laser device is now clinically proven to promote hair growth in males with androgenetic alopecia! Are you female? Then don’t worry, it works for you too! We are just waiting for confirmation from the FDA that the HairMax LaserComb is also cleared for female hair loss – watch this space! demonstrated that the LaserComb is safe in these subjects. females diagnosed with androgenetic alopecia. visit. Additional clinic visits were scheduled at 8 and 16 weeks. or dermatological conditions that would disqualify the subject from study participation. digital camera, hair clippings, and the investigator global assessment of new hair growth. adverse event profiles were similar between the two treatment groups. miniaturized hair in the target area. • Subject must have been experiencing active hair loss, within the last 12 months. • In good general health. • A Norwood-Hamilton classification of IIa to V.
• Skin Type I, II, III, or IV on the Fitzpatrick Skin Type Scale. • Between 30 and 60 years of age at the time of enrollment. hair care products during the study. coloring hair within 7 days prior to a visit. including adhering to scheduled office visits in a timely manner. before study enrollment were also acceptable). • Any active skin infection in the scalp area or scarring in the target area. • Photosensitivity to laser light. • Subject had used Accutane® in the previous year. • History of poor wound healing. • History of keloid formation. phenothiazines, or other medications at the discretion of the Investigator. loss, at the discretion of the Investigator. • Subject had light blonde hair, at the discretion of the investigator. of the scalp other than male pattern hair loss. the target area, which made it difficult to perform hair density assessments. or other medical conditions, at the discretion of the investigator. cause harm to the individual and/or compromise/confound the study results. were recorded. Qualified study personnel took vital signs (blood pressure and pulse). to assist the investigator in completing the global assessment. necessary to retake these digital images at Visit 2.
status and changes in or additions to concomitant medications since the Screening Visit. clipping and macro images for hair density evaluation (see below). to see if images were acceptable. If images were unacceptable they were retaken. investigator and uploaded to a designated site for image archiving. Subjects were randomized into two groups: LaserComb or placebo (sham device). Diaries to document subject use were distributed. file. Images can be displayed side by side. measurements were forwarded to data management for inclusion in the study database. events and changes in or additions to concomitant medications since the last visit. to hair clipping, tattoo (if needed), and preparation for macro images. same methods as at the Screening and Baseline Visits. clipped area following the site preparation. answering the questionnaire. Hair density evaluations were performed. personnel took vital signs and evaluated the scalp of each subject for local dermatitis. clipping, tattoo (if needed), and preparation for macro images. The designated hair site was clipped and prepared. The tattoo was reapplied if necessary. would you rate your overall hair regrowth?”). The last available visit was used. • Investigator’s global assessment of hair growth. All adverse events and vital signs. hairs/cm2. To allow for a 20% drop out rate, 116 subjects were to be enrolled. did not have a post-baseline hair density, although this was not specified in the protocol. treatment group was tested as a two-sided test at the 5% level of significance. sided test at a nominal significance level of 5%. demonstrating agreement under complete independence). baseline entry criteria (6 in the LaserComb group and 1 in the placebo group, p=0.42). termination visit (at 71 and 112 days) at which they had a hair density measurement done. placebo group who terminated prematurely is not included. demographics were comparable between the two subject cohorts. groups had comparable medical history. no subject in the placebo group did. significantly greater increase in mean hair density than subjects in the placebo group. graphically in Figures 2 and 3.
hairs/cm2, however, the difference remained highly statistically significant (p<0.0001). subsequent subgroup analyses. The resulting interaction had a p-value of 0.033.
in Tables 11 and 12. The benefit of the LaserComb is seen in all subgroups. amendment are shown in Table 13 for informational purposes only. this small number of subjects are comparable to those in males. questions in the Subject Questionnaire. decreased over time, achieving nominal statistical significance (p=0.010) at the last visit. of these responses are presented graphically in Figure 4. 15. There was no difference between treatment groups in this assessment (p=0.45). any agreement with actual hair growth. assessments among subjects in the LaserComb group than among those in the placebo. indicating blinding was maintained in the study. treated with the placebo device had four device-related adverse events. severe hypertonia of the neck and a severe migraine headache. placebo required other therapy to treat an adverse event. groups and quite similar between groups.